I wish I could say I had a plan, a vision or an idea of what needed to be accomplished when I started this project, but that simply was not the case. It was more happenstance than planning. It was a series of serendipitous events that evolved into a large project as information unfolded. The truth is, I had no idea what I was getting myself into. But that's what made this project so much fun and why I stayed with it. It wasn't a job; it was a hobby. It was March of 2008 and I just lost my good friend Muriel Chatterton. I was reflecting on the fun times and wonderful conversations I had with Muriel when I decided to take inventory of the friends and relatives that passed. Much to my dismay, I discovered I had lost 28 friends and 33 relatives through the years and there were many memories I cherished and didn't want to lose. I wanted to somehow preserve their memory not just for myself but for anyone who knew them. I decided to photograph their headstones and perhaps make an album, build a database, create a website or write a book in their memory. Who knew? I wasn't sure what I'd do but I felt the need to do something. So I became a Grave Hunter! I started to search for and find their graves then take photos of the headstones. It was during this part of my quest that I discovered the website known as Find-a-Grave and became a member. Find-a-Grave is a website dedicated to memorializing and preserving the history of those who went before us. It is a giant database of over 400,000 cemeteries with more than 114 million grave records. The Find-a-Grave family has grown to 48 million members contributing over 35,000 grave records a day and helping each other find loved ones or assist with research in genealogical projects. It is a website that anyone can join for free and create memorials for anyone they fancy. Each memorial can contain the birth and death dates, photos, a biography of the person and links to other deceased family members such as their mother, father and children. The memorial will also show the cemetery they are buried in, the date the memorial was created as well who created it. The person who creates the memorial is considered the manager of that memorial and is the only person who can update or edit the information in the memorial. In short, it is the perfect database for preserving information about your loved ones or people of prominence and historic figures. 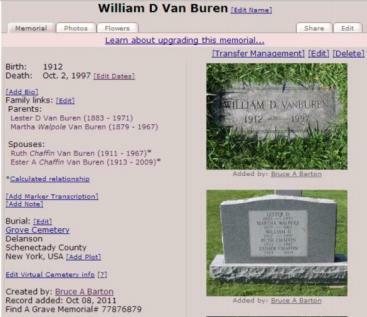 It can be found at http://www.findagrave.com/ and as mentioned, it is totally free. So, armed with this information, I began creating memorials for my family and friends on Find-a-Grave. I no longer needed to build a database. It had already been done. When you become a member of Find-a-Grave, you can choose to be a photo volunteer. A photo volunteer is a person who volunteers to take photos of graves for other Find-a-Grave members who live too far away to take the photos themselves. Volunteering to take photos for Find-a-Grave opened a whole new chapter in my life. People from all over the country were sending me requests to find and photograph their loved ones graves. I was astonished by the overwhelming need of people to trace their heritage and preserve their memories. I found it immensely rewarding to be able to help others with their research, and in fact, enjoyed it so much, I could hardly wait for another photo request to come my way. So in 2009 I decided, "Why wait for a photo request when I have a cemetery full of memories 1/4 mile up the road all waiting for a memorial?" And thus was born The Grove Cemetery Project. At first I had reservations about doing a project this large, but as the old adage says, "A journey of a thousand miles begins with the first step," so too does photographing 2000 graves in a cemetery. I put on my boots; picked a corner of the cemetery and started shooting pictures. I like simple plans. Most days I would visit Grove Cemetery and take photos, then return to my office and review my work. Digital photography allowed me to see immediately just how bad many of my photos were and could delete them as fast as I took them. I quickly realized that the sun played a crucial role with being able to read the writing on the headstones in my photos. I found that if I photographed the headstones with the sun's rays at tangent to 10 degrees off tangent of the face of the stone, the results were stunning. Over the next three years I shot 1000's of photos trying to perfect my techniques. I photographed in the sun, in the rain, during every season of the year and slowly perfected my techniques while also building special tools to find and photograph headstones. The good photos were posted on Find-a-Grave and the 5000 or so bad photos made it to the virtual trash bin. 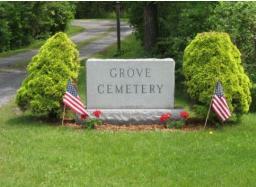 As I became more familiar with Grove, I realized that there were many family members buried together. Using the tools from Ancestry.com, I began researching each family I photographed to determine how they were related to each other so I could link them on Find-a-Grave. Linking memorials on Find-a-Grave is a valuable feature that shows how family members are related to each other. Clicking on a link will take you to a family member's memorial. In all fairness, I should point out that I did not enter all the memorials on Find-a-Grave for Grove Cemetery. As mentioned earlier, anyone can post a memorial on Find-a-Grave and there are hundreds of memorials and photos entered by other Find-a-Grave members for Grove Cemetery. In addition, Lenny Van Buren and Bob Flower also spent considerable time and effort providing much information on grave locations as well family links and I will forever be in their debt. Truly, I am amazed at the patience they exhibited while being besieged by all my questions and queries. Throughout this three year period of taking photos and photo requests, I became a regular fixture at Grove. After all, I was up at Grove almost every day taking photos and asking questions and I believe I sometimes saw Lenny and Bob running away or at least hiding as I entered the cemetery, but that could just be my imagination. It was in the summer of 2011 during one of my many question sessions with Lenny Van Buren that he told me about the fire in the early 30's that destroyed the burial records for Grove and as a result those people buried without headstones could not be located. One does not realize the importance of that statement until you understand just how many people are buried without headstones. I estimate that at least 20% of the graves I try to find have no headstones. Lenny estimates that 30% are buried without markers. Without burial records, they are all lost to posterity. How tragic. Lenny then mentioned the need to back up the Grove Cemetery records so that something like that could never happen again. Not in my wildest dreams could I have imagined that such a superb project would come my way. As a database developer, I immediately considered building a database for the Cemetery, after all, that's what I did for a living and that's what you do for this sort of thing, isn't it?. But after really thinking about it, I knew it would take many man hours to build the database with interface and enter the data. Then it would have to be verified. Unless a lot of volunteers were found, the cost of accomplishing it would be prohibitive. The rest of the summer and that whole winter I let the idea rattle around in my head and I ran it by other professionals I knew in the field as well. Everyone agreed it would be a monumental task and very expensive. We had to backup 2100+ index cards on both sides, a 32 page single spaced burial ledger, an 80 page Lot Sale ledger plus giant maps of all the sections of the cemetery. It seemed like a project way too big for one person, but the real problem was that I wasn't thinking outside the box. In the spring of 2012 another Find a Grave member suggested photographing the records instead of copying them or creating a database. Bingo! It was a great idea, simple and cheap. So I set up a folding card table with three adjustable elbow lamps mounted to it. Each lamp had a 100 watt white compact fluorescent bulb in it. I made a cardboard jig that would hold the index cards in the same position and taped it to the table so it wouldn't move then used my tripod to mount my camera above the jig. I set the camera to take the highest quality photographs possible and after some testing began clicking away. The result was a very simple light table that could photograph index cards and ledgers as fast as I could turn the pages. The whole project took 4-5 days in my spare time resulting in the complete backup and preservation of all the Grove Cemetery burial records in .jpg format as well as all the photographs I took of the graves. The files were then copied to one very small inexpensive 2 gig SD chip that can be stored in a safety deposit box in the bank or a pack of gum if you so desired. Best of all, I found it faster to access the records on the chip than going to the ledgers, cards and maps to try to find the information. Yearly or bi-yearly updates can be performed in 30 minutes by simply keeping track of any new entries in the journals and photographing the new page or pages along with the new index cards and adding them to the SD chip. Additional copies of everything can be made in second. Like I said, simple is good! Now that I had backed up the files and ledgers in a digital format, I was able to quickly find graves and verify the current records with the photos of the graves I had taken without asking Bob or Lenny for assistance. To facilitate the verification process, I developed a searchable spreadsheet using MS Excel and listed all the photos I had taken in Grove and began verifying them with each record in the Grove Cemetery ledgers. One by one I checked each grave and listed the grave location for each grave on the spreadsheet. Each entry on the spreadsheet was also linked to the memorial on Find-a-Grave providing immediate backup and biographical information about the deceased and their family members. To finalize the verification process, I visited each grave in the cemetery again and confirmed the headstone information and grave location. 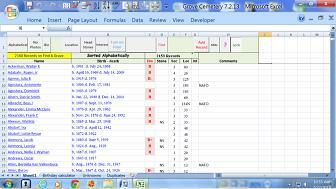 The process took several months over the summer and through the winter of 2012-2013 to finish but the end result was a very powerful searchable spreadsheet that provides easy and immediate access to all the graves in Grove Cemetery. It allows us to manipulate the data into multiple sort routines, filter out data we don't need to see and can be easily expanded at anytime. It also provides a secondary backup system for Grove and further preservation of their records. After the spreadsheet and verification process was complete, I wanted to have a way in which the public could easily access the Grove burial records to find their loved ones as well as spread the word about how wonderful Grove Cemetery is. I figured the best way to accomplish this was to build a website. But there was a problem; the problem was I never built a website before. I sat down with my son Bryan and discussed the website idea. He convinced me it was a great idea and could be accomplished even by a novice like myself. I needed a web builder that was simple to use and cheap to run. GoDaddy fit the bill. GoDaddy is a web hosting company with its own incredibly easy to use web building software. 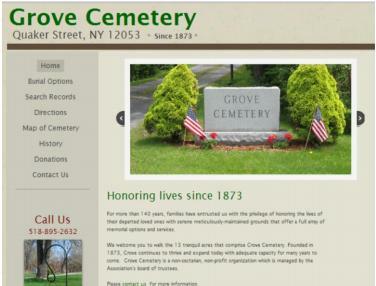 I opened a GoDaddy account and secured the grovecemetery.net domain name and was off and running in 30 minutes. Three fun-filled days later on May 1, 2013, www.grovecemetery.net went public. Ironically, it had taken me longer to decide to build the website than it took to actually build it. The site has a large assortment of photos I took to show the beauty of Grove as well as the ability to search the Grove burial records using the Find-a-Grave search engine. I included a page on the history of Grove by Lenny Van Buren and a list of notable residents in Grove that link directly to Find-a-Grave where you can read all about their accomplishments. It also includes directions on how to get to Grove, a map of the cemetery and a contact page to make it easy for anyone to contact Grove officials. It's a simple, straight forward website that's functional, fun to visit and gives the user the ability to access the historic records of Grove Cemetery without disturbing or destroying the original records. After all, what good is preserving history if you can't safely access the records? But the work is not over by a long shot. There are about 150 graves without burial records and death dates on their stones in Grove, so we don't really know if the name of the person etched on the stone is actually buried in Grove! And if roughly 20 - 30 percent of the burials are without headstones, there could easily be another 400 - 600 people buried in Grove that are unaccounted for. By finding obituaries and reading old newspaper articles while studying the records that are available, I've been able to find and locate burial locations for about 40 -50 people who were buried in Grove without headstones. So there is still a long way to go and this is just one small cemetery. Just imagine how many records have been lost in the 400,000+ cemeteries across the country and you can begin to see the importance of backing up records to preserve the history these records create. As I see it, the deceased still have a story to tell that we can learn from, and preserving their memory and the history they created is as important as the life they led. I'm glad I've been a small part of that and I'm determined to continue the hunt.